This gripping edition of Primetime explores the vastly different method of juvenile detention that has been adopted in Missouri. Focusing on positive reinforcement, nurturing and talking openly about issues, this method has seen extremely successful results. In fact, only 10% of the juveniles in this system end up in adult prison, which is a strong indicator that this program works. By watching "Missouri's Different Approach to Juvenile Justice," viewers will learn more about this unique way of treating juvenile inmates -- and how its success is changing the way we look at discipline. When you think of juvenile detention, you probably think of wayward kids. Out of control youth. Rage issues. Orange jumpsuits. Dark cell blocks. But Missouri has a different approach to juvenile detention. 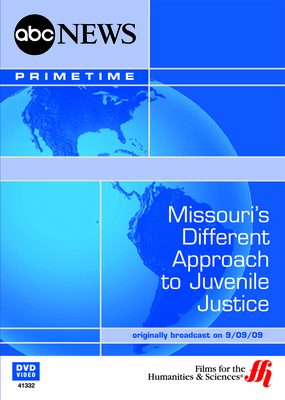 In this powerful edition of Primetime, viewers will learn how Missouri's juvenile detention centers have instead chosen to focus on their inmates talking through issues, reconnecting with family, receiving genuine nurturing and encouragement, developing healthy routines and channeling emotions in a positive way. And it's worked. Even though there are no guards and no lockdowns at juvenile detention centers in Missouri, very few juveniles attempt to escape. These inmates claim that, for the first time in their lives, the detention center has given them a stable environment where they are encouraged, supported, nurtured and heard. In this powerful show, viewers will see how this combination of nurturing and discipline has transformed wayward youth into productive members of society. Even after release, case managers monitor the juveniles that are released from the detention center so these youth always feel that they have somewhere positive to turn. This unique, especially gentle and understanding approach -- rather than tough traditional discipline -- has helped young convicts come to the terms with their past so they can create a better future. Missouri Juvenile Detention Centers � Missouri�s juvenile criminal justice program offers a safe, stable and disciplined environment where offenders have the opportunity to learn how to become contributing members of society. Rosa Parks Center � An inmate discusses her past which includes a difficult relationship with her mother and a history of drug use. There are not many attempts by juveniles to escape from the center even though it has relatively low security. Checking In: Talking About Issues � Boys at the Waverly Regional Youth Center are divided into groups of about 10 to 12. Routines and discipline are enforced. School is a mandatory requirement and several of the inmates graduate. Conflicts are settled with a technique called �checking in� which involves talking it out. Releasing Inner Secrets � Juveniles learn how to settle differences between each other amicably and how to support their peers. One inmate reveals how he was sexually abused as a child and starts down the path of healing. Indeterminate Sentencing � Juveniles all get the same sentencing � indeterminate. They are not allowed to leave until the counselors and the staff feel that they are ready and rehabilitated.